First reported by Variety, plans have been announced for August Moon, a 40,000 square foot indoor “drive-in” located at 14 James Robertson Pkwy, in what is now Main Event Parking, just east of Interstate 24. The space will feature “full-sized trees, grass, gravel pathways, hammocks, a panoramic starry sky overhead, fireflies, and, of course, a stunning August ‘sailor’s moon’ glowing orange and red, just above the tree line” in a climate-controlled area under an air-supported dome. The projected completion is spring 2018. 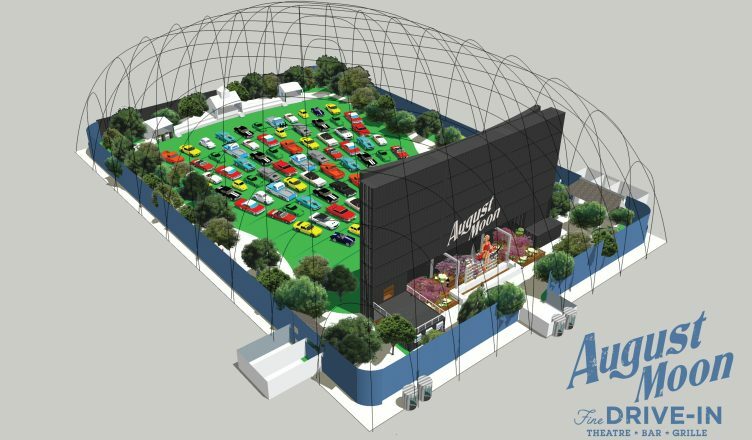 The August Moon Drive-In is conceived as a mini indoor theme park that transports people in space and time to a quintessentially American experience – where that perfect summer night at sunset, where crickets chirp in the distance and the audience breathes in the scent of fresh meadow air, can be repeated with absolute consistency within what is effectively a giant movie set. In addition to being a re-invention of the movie-going experience, August Moon will allow audiences time to explore, play, and dine, and of course, watch their movie. Dining at August Moon will be “artisanal American comfort food” and popular concession foods as well as several full bars. And though seemingly targeted to tourists, the drive-in will offer a “membership model that allows people to see any movie without paying admission and will offer other perks such as food and drink specials, seating upgrades and special access.” Members will also be able to vote on titles through social media to determine the programming shown. With a planned 18 showings per week, there will be numerous family-friendly movies for matinees and early shows and other genres for later shows. I spoke with Michael Counts, the creative mastermind behind the project who said that Ken Levitan of Vector Management had come on board as a partner and made the suggestion. As it so happened, around the time of early discussions, Nashville had been named the “Most American of American Cities” as a result of a WalletHub study. What better place for this very American drive-in concept? So what is an “immersive” theater experience? Though the project seems ambitious by Nashville standards, Counts is known for his “immersive” theatrical projects, including The Ride in Manhattan, The Walking Dead Experience, and PARADISO: Chapter 1, also in Manhattan. These programs seek to transport the theater-goer to a specific time and place (the other productions have been quite successful). The theater itself will be like a soundstage and envelope the guests into the experience. Along with Levitan (who co-produces the Music City Food + Wine Festival), other partners include behind-the-scenes entertainment heavyweights James Diener, Michael Solomon, Daniel Frishwasser, and Barron International Group, so there’s a lot of talent and faith going into this project. Though East Nashvillians may rather have a legit multi-screen movie theater, this theater represents a trend toward providing better dining options (see: The Alamo Drafthouse in Austin) and more user-friendly movie experiences. No doubt any theater experience is going to be better with a good meal and any Pixar movie will be that much better with a beer. 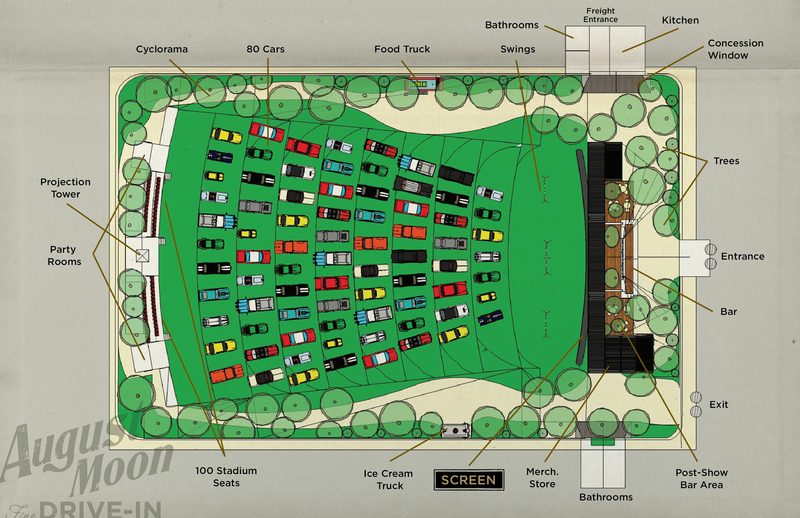 Check out the site plan for the theater, complete with swingsets up front, just like the drive-in theater I went to as a kid.